There’s always something new to discover in downtown Dallas. Photo by Porttia Portis. If you’re planning on moving to downtown Dallas (or you already live in a downtown condo), it’s safe to say that easier commutes and a break from suburban life are big reasons driving your relocation. If we’re being totally honest, the FOMO probably also played a huge part. 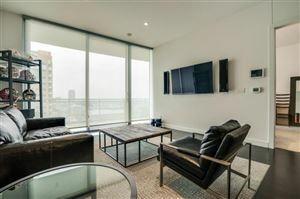 Whether you’re living downtown for professional or personal reasons, even the most savvy city dweller can overlook some of the awesome amenities and secrets that downtown has to offer. If you’re planning your next move or rediscovering your love for your neighborhood, these hidden perks of living in downtown Dallas are your insider’s guide to urban living. Pizza joints have always been a safe haven for the inebriated, providing cheesy, meaty goodies to soak up a night’s drinking, along with responsible bartenders who look out for your well-being. But Tutta’s Pizza takes it a step further with a free shuttle. The service, offered through local shuttle company Efrogs, is as easy as texting your location to the dedicated number. Just remember karma, and don’t forget to tip your driver! Weekend trips to the Dallas Farmers Market are made easier with the DFM’s complimentary shuttle. On Saturdays and Sundays from 11 a.m. to 2 p.m., riders can catch the D-Link to and from the Pearl Street location, with pick ups at Akard and Main, or Akard and Commerce. Klyde Warren Park: the only responsible way to hang out on a freeway. Photo courtesy of Dallas Arts District. Even though the goal of going outside should probably be to enjoy nature before whipping out your phone, Klyde Warren’s free Wi-Fi connection allows you to experience the best of both worlds — skies and screens, with the added bonus of a rotating food truck fleet and more dogs than you can shake a bone at. The West End’s favorite brunch spot is all about giving back to the hardworking people of the neighborhood. With a high concentration of medical centers in the area, and El Centro’s nursing college located just down the street, Ellen’s serves as a popular early morning meeting place for nurses, thanks to their happy hour specials for medical professionals. With a full bar and a 7 a.m. opening time, it’s a great way to unwind with a carafe of mimosas after a hard night’s shift. Although there’s more than enough to see in our picturesque downtown, there’s a whole other level (literally) to what the city has to offer. The access points are at notable attractions such as Thanks-Giving Square, Renaissance Tower, One Main Place and Bank of America Plaza, enabling you to explore the vast labyrinth of underground shops and restaurants without removing you from the city hub. Plus, it’s air-conditioned! As delivery services for every product imaginable become increasingly popular, downtown residents often enjoy first dibs on the latest delivery services. Dense metropolitan areas are the prime target demographics for these companies, so living downtown will get you quick eats before anyone else, including grocery and alcohol couriers. This also means fewer party fouls when someone forgets the wine.